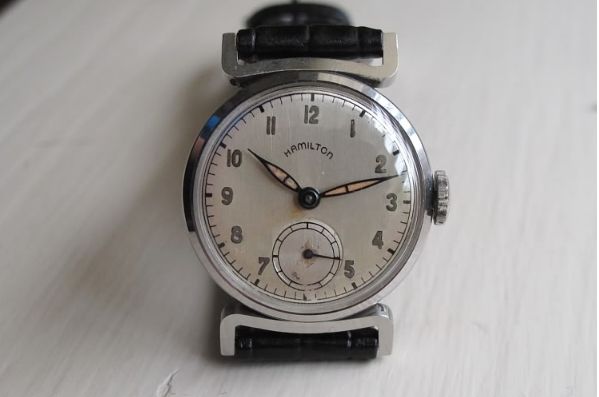 Hamilton first introduced stainless steel in watches with the Lexington in 1941. Other manufactures offered watches with steel alloyed case backs before Hamilton but Hamilton's quality-oriented lineup typically matched case backs to case bezels and didn't cut costs by substituting a less expensive material. However, stainless steel does have it's advantages - first and foremost is durability. 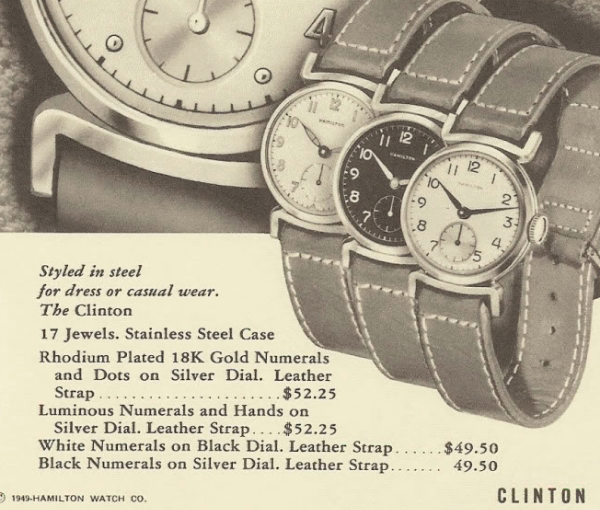 In 1949 Hamilton introduced another two all stainless models - the Raymon and the Clinton. The Clinton was produced for 4 years. It's the second model to bear the name. There was an earlier Clinton (aka Greely) that was introduced in 1931 but wasn't shown in catalogs. There are actually a variety of Clintons out there.. all four have sterling silver dials. One dial has rhodium plated numerals and dots (to appear silver) on a silver butler-finished dial. Two all-numeral dials have solid gold applied numerals that are rhodium plated or black painted and came on black finish or a silver butler finish, respectively. There was also a luminous dial with glow in the dark hands and numerals. I have never seen the black figured dial with matching black hands... I think that might be the rarest variety. 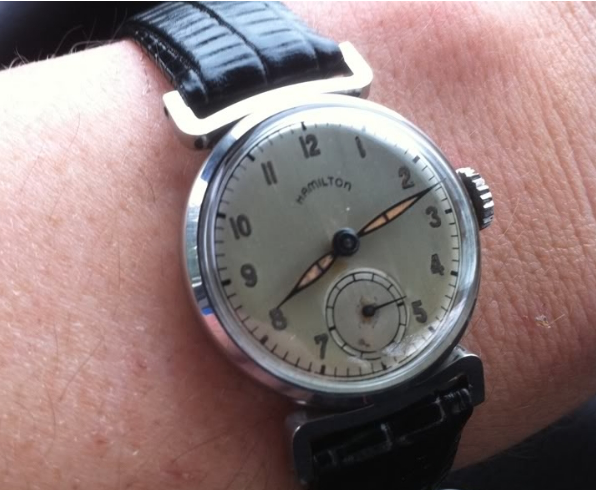 Behind the dial is Hamiltons 8/0 sized, 17 jewel 747 movement, which was introduced in 1947. Although stainless steel is extremely durable, I have found that you often see Clintons for sale with missing lugs. I guess the weld that held the curved lugs to the case could fail over time. It can be repaired though. I've only had one Clinton, the luminous version. It's a decent looking watch, I suppose. However, it's a bit on the small size by today's standards. With the hands set to 10:12, the usual time that Hamilton displayed its watches in advertisements, the luminous hands look like cat's eyes peeking out of the dial.